This machine was built for and by Hugo himself. 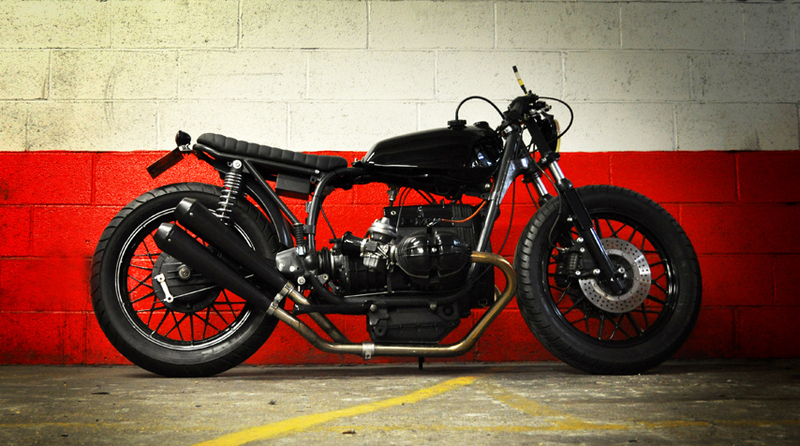 The donor bike here is a BMW R100 /7 from 1984. We called it "The Black Pearl". Matt dark grey powder coating of the frame. Bespoke rear loop (100% stainless steel). The bike has been lowered by 12 cms. Yamaha 500XT tank shiny black painted. The speedometer has been inserted in the top end of the tank. Genuine yellow headlight coming from a rally car of the 70's. 18 inches front wheel coming from a R45. Bespoke seat made to match the bespoke rear loop. 100% bespoke stainless steel 2 in 2 exhaust pipes. High temperature balck painting of the mufflers. Front fork lowered by 12 cms. Bespoke electricity box hosting a Ion-Lithium 12V battery.